I went to the eye doctor last weekend because it’s getting so difficult to see things up close, I was sure that it was time for bifocals. I should have checked this website, because I see that I’ve gone before for the same thing, and it’s that my eyes are getting better. My glasses are too strong for my self-healing eyes, so they over-correct for things up close. It’s interesting comparing the numbers on that screen above to my final prescription. Apparently the machines they run you through during the pre-doctor rigmarole do a quick diagnosis, and it’s fairly actuate. My left eye is -4.00 both times and my right is -3.00 pre-test; -3.25 post-cute-doctor. I was by myself for the appointment, so I didn’t look at glasses afterward. Listen up, Lenscrafters, ’cause Lloyd’s got an idea: You need to install some iPads in your store. Prospective buyers can stand on one side and have their picture taken with various new frames, then stand on the other side and review those photos while wearing their own glasses so they can see what they look like. That’s a money maker right there, and he’ll settle for 40%. Genius idea by Lloyd! I always wonder what my glasses REALLY look like since everything is all blurry in the mirror. In the past I have asked the staff for their opinions but they always seem to say the most expensive frames look the best on me. I had to take the Motor Vehicle Administration eye test on Friday. I was nervous about it because my contact prescription is a couple years old. I passed. Do you think you’ll ever not need corrective lenses? That would be interesting, wouldn’t it? HA! For some odd reason I have always been under the impression that your eyesight was worse than that. Well, more accurately, worse than mine. I don’t know why. But you know? My right eye is -3.50 and my left is -3.75. If it was an addition thing, we’d have the same vision! -7.25! What’s yours Brad? Peggy? Gretchen? Anyone else? I’m so curious now! And yes to Lloyd’s idea. Yes, indeed. My current prescription is -3.5 and -4.25. The worst that I can remember is -3.75 and -4.50, so I’m moving up! Woo-hoo! Hey, our eyes are the exact same badness! I got the bifocals and I like them. I haven’t taken the eye test and my actual perscription is somewhere between Little Rock and Gangelt, Germany at the moment so I can’t tell you exactly. But I will say that the last two times I went to the eye doctor (two different doctors) they commented, “WOW, you have really bad vision!” This from people who deal with vision-impaired people all day long. Interesting. Maybe even tactless. Or maybe they were just trying to make me look into the Lasik option. -4 on both sides for me. Anytime I get my eyes checked, they always say, “that can’t be right…they’re never the same.” Mine are. I’m a mutant. Mine are the same too, Jill. -2.75 on both sides. I love it. My contacts are interchangeable. That’s why I love it! Yay for being mutants! I only bring this up because I had to remove one yesterday. Thankfully it was from my own foot and Anna couldn’t comment, “Mom, just bring it closer if you need to see it better.” She knows my legs and feet don’t contort like hers do. 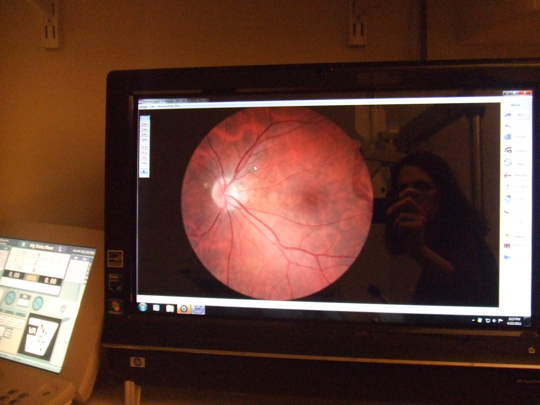 And is that really a picture of your eye….AWESOME! It would be really cool to have that on the screen at Halloween, especially if you could make it pulse! I don’t know what numbers my eyes are. I don’t wear glasses & I haven’t had a real eye test in a long while, just the MVA one. Maybe I should look into that. That was actually my old idea --well, actually the old idea was a mirror that was actually a computer display with a camera in the middle. The display would be a touch screen and you could press a save button to “take your picture” and a view button to see your pictures after you put your regular glasses back on. It would keep track of the frames that you were trying on and tell you how much they cost as well as any other interesting frame information along with the pictures. You could narrow it down until you had the frames that you liked. Then you could send that info to the counter and they could ring you up and delete your frame pictures (or save them for next time). But that was the old idea. The new idea is to have an iPad, but instead of taking pictures with it, the iPad would be aware of your prescription (you’re in a glasses place, right) and “adjust” the image that it was displaying so that it looks correct to your eyes even though you are using the frames with the fake lenses in them. How cool would that be? It should also have all of the other stuff from the fixed display as well (like snapshots and frame information). That’s my new million dollar idea. Sounds like a really expensive mirror. Yeah, I used to have perfect vision too. What we don’t realize is that four-eyes over there tries on new frames and has absolutely no idea what he looks like in them. I’m almost legally blind. Still sounds like an expensive mirror.